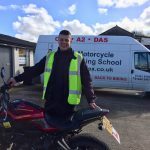 Well done Justas Koncius of Morden, for passing DAS with us, and in the sunshine after all that bad weather! So will it be a nice ride back to work in Paris, maybe the Eurotunnel and across the countryside – what better way to start a days work?!! !